In this article I will show steps to configure AD connector on AWS, before that let us know brief description about AD connector. AD Connector is a dual Availability Zone proxy service that connects AWS apps to your on-premises directory. 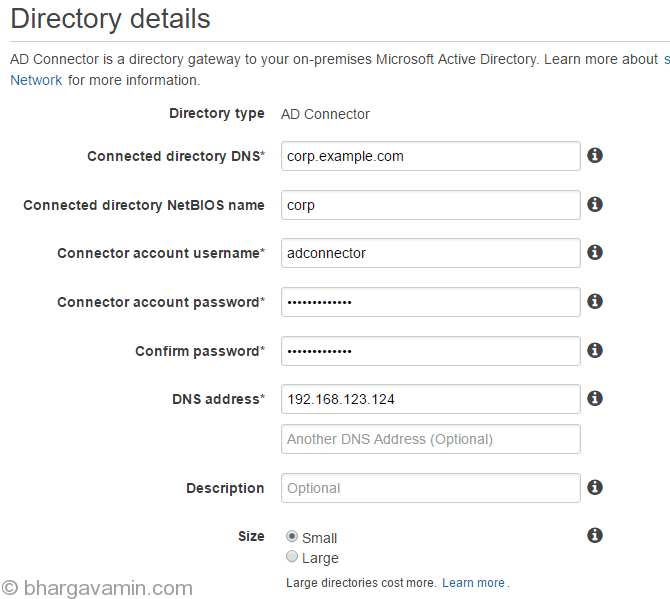 AD Connector forwards sign-in requests to your Active Directory domain controllers for authentication and provides the ability for applications to query the directory for data. When you configure AD Connector, you provide it with service account credentials that are securely stored by AWS. This account is used by AWS to enable seamless domain join, single sign-on (SSO), and AWS Applications (WorkSpaces, WorkDocs, and WorkMail) functionality. Given AD Connector’s role as a proxy, it does not store or cache user credentials. Rather, all authentication, lookup, and management requests are handled by your Active Directory. In the AWS Directory Service console navigation pane, select Directories and choose Set up Directory. In the Connect using AD Connector area, choose Create AD Connector. Provide the following information in the VPC Details section and choose Next Step. It takes several minutes for your directory to be connected. When it has been successfully extended, the Status value changes to Active. If you recieve Status value as Failed then look for detailed error description.